To buy or not to buy? That is the question on a lot of people’s minds about the growing trend of smart sports watches. The rise in popularity has seen participation from some of the most renowned brands in the world; Garmin being one of them. We took a closer look at two very appealing sports watches being manufactured by Garmin at the moment. Both different and valuable in their own ways, take a look for some guidance in selecting the right smart sports watch for you. You may be wondering “But why the hype?”. We’ll tell you. Smart Sports watches are changing the way we engage with our day to day sporting activities as we know it. Gone are the days of lugging around individual pieces of machinery in order to collect data, or determine a running path. In fact, with sports watches, athletes now don’t even need to have their cell phones on their person at all during an activity. All the information you could possibly need is right there on your wrist. In the past, you were required to use a cellphone or other devices in order to calculate the specifics of your workout. Sports watches eliminate this need while also featuring a variety of other functions; like music playing, for example. For the better part of the millennium, Garmin has been the industry leader in GPS and navigation technology. These days it’s hard to imagine cars without built-in navigation or at least portable Garmin devices somewhere inside. Naturally, Garmin would then be at the forefront of a lot of the GPS watch technology coming out today. The watches being released by Garmin as solutions for athletes feature unmatched GPS mapping quality. Whether you’ll use the device while on the golf course or on an intense hiking trail through no-mans-land, the quality of GPS is unwavering. Today we will compare the original Fenix 5 to its brother, the 5 Plus. 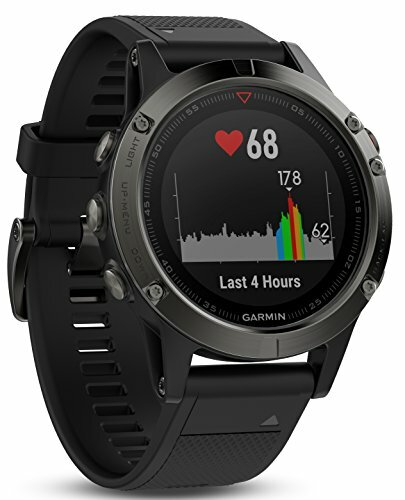 The Fenix 5 was the base model designed by Garmin. Over time, their updates and improvements have been built into units that stemmed from this basic product but are now way more feature & performance packed. Both are equipped with 24/7 fitness monitoring and heart rate sensors. They’re able to receive feedback and notifications from external Smartphone devices. They’re both waterproof up to 100m. They feature QuickFit bands that can be easily interchanged. One notable difference between the watches is the battery life. The 5 Plus can last up to 10 days at full charge while the 5 performs at slightly less than this. Both watches burn through an incredible amount of battery when in GPS mode. Unlike the 5 Plus, the 5 doesn’t have Wi-Fi capabilities and can’t stream music directly to your headphones. In retrospect, the additional features in the 5 Plus compared to the Fenix 5 are more for enjoyment and interest’s sake than anything else. Both watches have similar capabilities in getting the sporting side of things done. 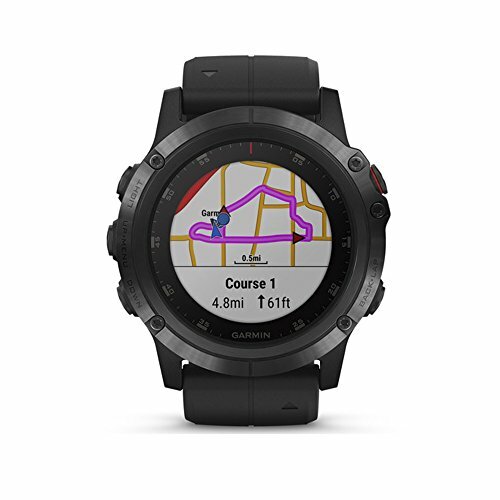 As a standard feature, the Garmin Fenix 5 has the ability to reflect and absorb sunlight so that the visibility of the screen is never impaired. Although the resolution is slightly less than in its follow up units, the software remains the same throughout. The watch will provide you with 24/7 feedback on your motion and body conditions. The advanced range of sensors is constantly at play, picking up any indication of changes in heart rate & blood flow. The exterior is rugged and durable. There are just a few buttons embedded that assist with some controls; for everything else, there’s the touch screen. The Fenix 5 Plus is really just a one up of the aforementioned unit. It’s packed with a few more features and slightly faster software, which gives the watch all of its appeal. The ability to load your credit card into the watch is one of the most notable advances in the technology. This gives you access to Garmin’s tap-and-go payment program that works at any entity equipped with a relevant scanner. Durability is standard across the whole Garmin range. The watches are made from scratch resistant stainless steel, perfect for even the most intense of workouts or even outdoor activities. What’s great about the 5 Plus is its ability to sync with your headphones for audio streaming and playback. For some people, this is worth the additional price tag. When it comes to sports watches, Garmin impresses the market day after day. Their quality and performance are worth the extra dollars. Both the Fenix 5 and the Fenix 5 Plus are investments in your athletic journey and even your health. Take your experience to the next level and select one of these devices as your watch of choice today.